As a child this was my favourite rice preparation. My love for panpole has not lessened in any way over the years. I remember fights at the dining table for the thinnest and crispiest panpole, as mom would serve them hot off the pan into our outstretched hands. 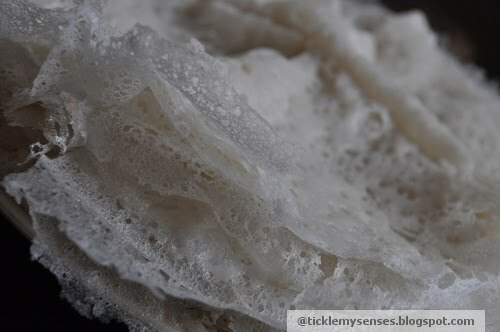 This is a paper thin soft rice pancake which is very tasty, easy to make and loved by all. It can be easily eaten by the dozen as they are so light. Best eaten with vegetable stew curry, chicken or mutton coconut curry or simply with honey. Most often these panpole/ neer dosas are made using a ground mixture of rice and water. But I have deviated from the traditional recipe using coconut milk instead. 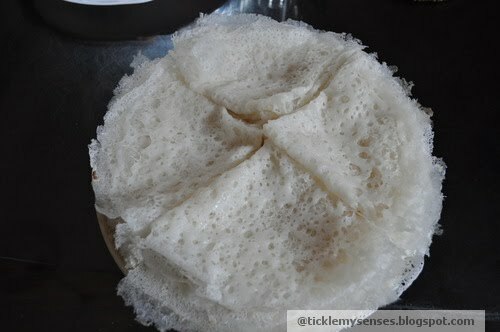 The panpole/ neer dosas made using coconut milk have a better flavour. 1. Soak washed raw rice in sufficient water for an hour or two. 2. Grind the drained rice along with coconut milk to a very fine paste. 3. Add water to the batter to make it to very thin pouring consistency. 5. Grease a regular pan using an onion dipped in oil. Heat pan well. Add a ladle spoonful of batter, immediately turn the pan in a circlular motion to allow the batter to flow evenly to the edge of the pan base. Close the pan and allow the panpole to cook for 2-3 minutes or until the sides of the panpole start lifting from the pan. Do not turn the panpole. Carefully lift the panpole and place on a wooden chatti. Fold the panpole in half to form a semicircle, and then once again to form a triangle. Using back of a teaspoon rub a little oil to surface of folded panpole. 6. Repeat the same for the remaining batter. For best results, if you would like your panpole's lacy and crisp at the sides and soft in the middle like we do, use the traditional cast iron flat based dosa pan that was traditionally used in Mangalore to make these dosas. Though the pan is not non-stick, if greased and heated well can produce the crispiest dosas. The batter needs to be ground really fine and the consistency of the batter needs to be as for Rava dosas. Thanks for the recipe.. I stumbled upon your blog searching for Kuvalo recipes. It is nice to see a variation on the panpole! You are welcome Sandy, i hope you liked this version. Vegeterian Mangalorean Radish Theil Piao.